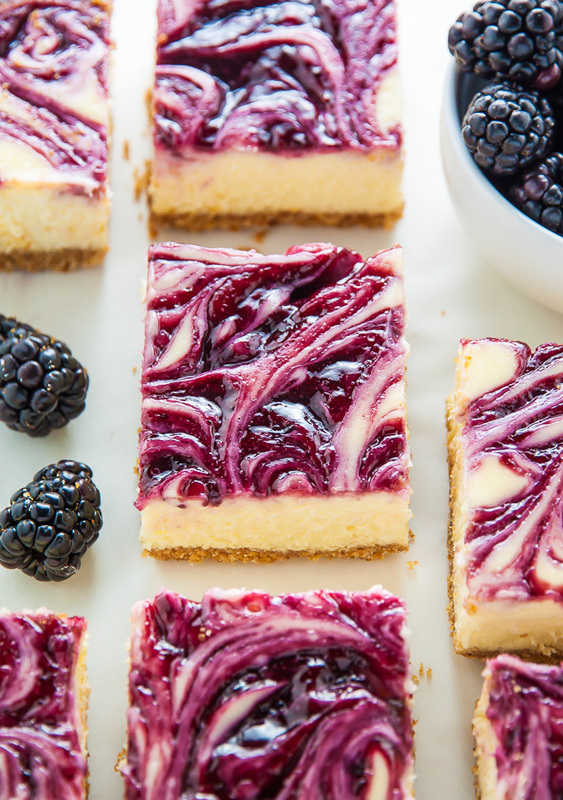 Fresh and Fruity Blackberry Cheesecake Bars! Creamy and rich, these taste just as good as regular cheesecake but MUCH easier to make. Say hello to the most beautiful dessert to emerge from my oven all year. 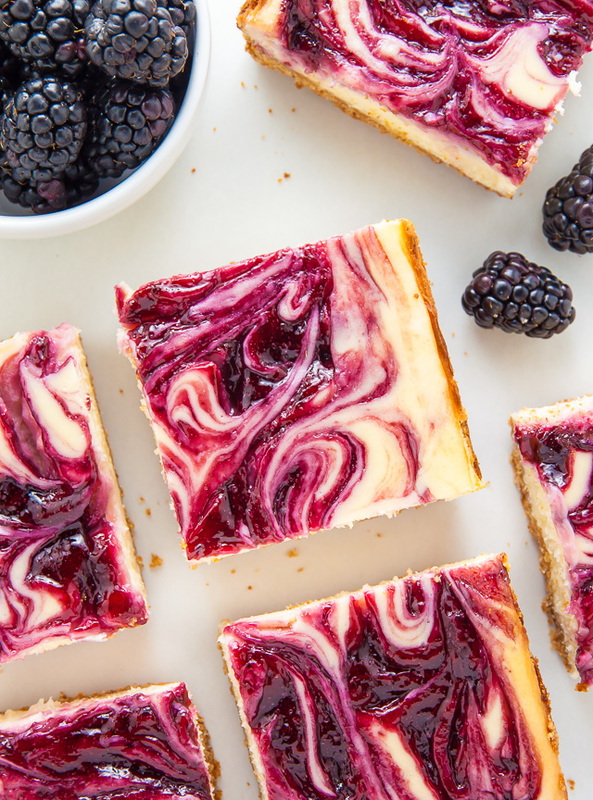 I mean, seriously… how rich and creamy and swirly and stunning do these blackberry cheesecake bars look?! Hard to believe, but they taste even better than they appear. I’ve had berries on the brain for weeks now, so when I spotted blackberries on sale, I swiped up as many as I could carry. So plump… so purple… I couldn’t resist! I devoured one pint before I even reached home, used a second to make my neighbor lemon blackberry cupcakes (her fave! ), and the third? You guessed it! I made blackberry cheesecake bars. Full disclosure: I’ve actually made them 3 times now! One for my yoga instructor… one for my UPS delivery man (he’s a blackberry fanatic!) and one for… me! I have 3 hearty slices sitting in the fridge, so suffice it to say, I’m already dreaming of dessert tonight. 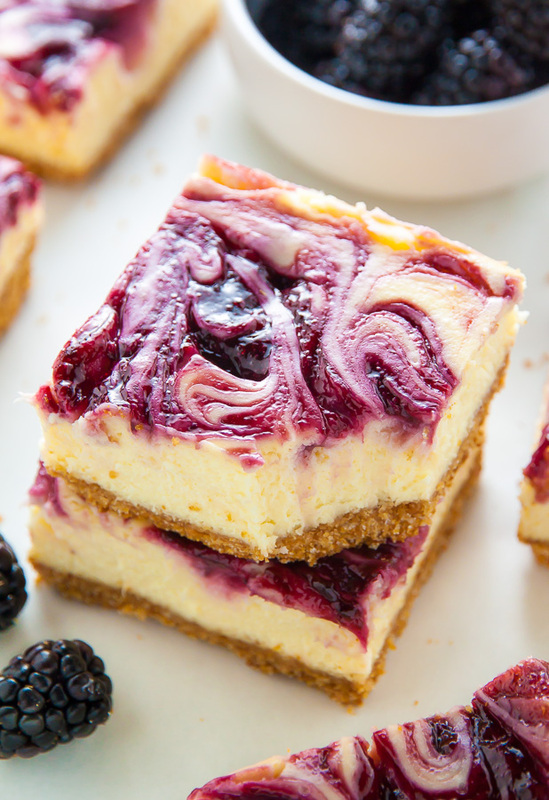 There are three parts to this recipe: the graham cracker crust, the creamy cheesecake filling, and the fresh blackberry swirl. I know that probably sounds like a lot of steps, but I promise, each one is pretty easy and very straightforward. Plus, I’m going to talk you through every step, and am always here if you have additional questions. This recipe begins with the graham cracker crust, so that is also where we shall begin. To make the crust you will need melted butter, crushed graham crackers, granulated sugar, and a pinch of salt. You can buy graham cracker crumbs that are made especially for cheesecake crusts at certain grocery stores, or you can just buy a box of graham crackers and make them into crumbs yourself. Making them into crumbs is super easy! You’ll simply place them in a blender or food processor and pulverize them into small crumbs. Once they’re crushed, you’ll combine them with the melted butter, sugar and salt, then press this mixture into your prepared pan. The crust is partially baked for 8 minutes, then you’ll set it aside to cool while you prep your filling and swirl. Time to talk about the filling. You’re going to need cream cheese, eggs, egg yolks, sugar, flour, fresh lemon juice, and lemon zest. Super basic ingredients! Once the filling is assembled, you can pour it over the prepared crust. Your blocks of cream cheese MUST be very soft before you make the batter. I typically leave my blocks of cream cheese out on the counter for at least two hours before I plan on baking. If you try to blend the cream cheese cold, it will clump up and won’t develop into a smooth batter. You should also bring your eggs and egg yolks to room temperature. Batters made with cold ingredients don’t come together smoothly, so be sure to take the extra step and bring them to room temperature. The lemon juice and zest adds a very subtle but lovely pop of citrus to the cheesecake bars. If you prefer, you may substitute an equal amount of lime juice and zest. The lemon (or lime) juice is essential to the texture of the cheesecake, however the zest may be left out completely, if desired. Be sure to line your pan with heavy duty tin foil or parchment paper, allowing two sides to overlap. This makes it super easy to lift the bars out of the pan neatly. 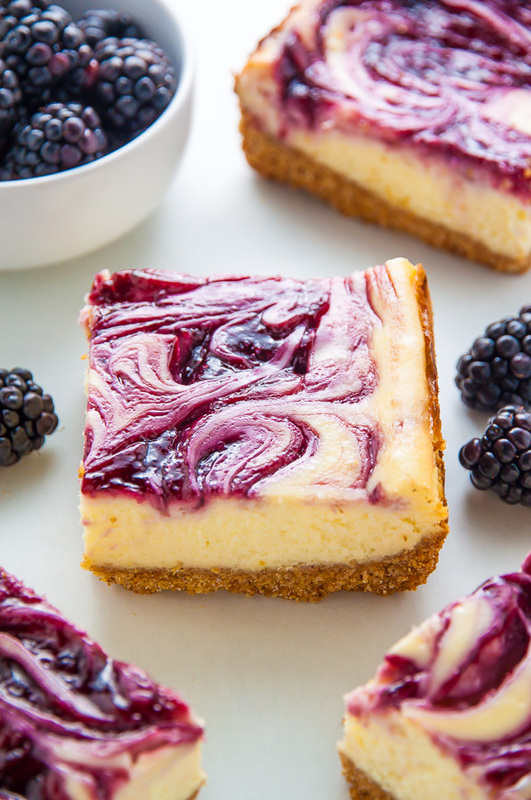 To swirl, you’ll dollop the blackberry mixture on top of the unbaked cheesecake batter by the spoonful, then use a skewer to gently swirl into desired design. Swirl as much or as little as you’d like, but be sure not to dig the skewer too deep into the batter, or it will tear the crust. P.S. You can make the blackberry swirl the day ahead and keep it covered in the fridge. I have not tried baking this recipe as a full cheesecake (in a round pan), so I am unsure if it works, or how it comes out. Be sure not to over bake your cheesecake bars. While I’ve included a bake time in the recipe box below, all ovens run a little different. You’ll know they’re done when the edges are completely set and the center has just a slight wiggle. Cool the bars completely in the pan, in the fridge, before lifting them out and cutting them. If you adore cheesecake, but don’t feel like busting out the springform pan or building a water bath, this recipe is for you! Easy, elegant, and so delicious, these Blackberry Cheesecake Bars are sure to be on heavy rotation all Summer long. 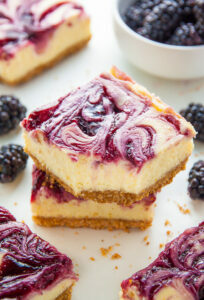 Creamy Lemon Blackberry Cheesecake Bars! Easy, convenient, and so delicious. Line a 9×13-inch baking pan with aluminum foil, allowing two of the sides to overlap. Spray foil and any exposed pan with non-stick baking spray; set aside. 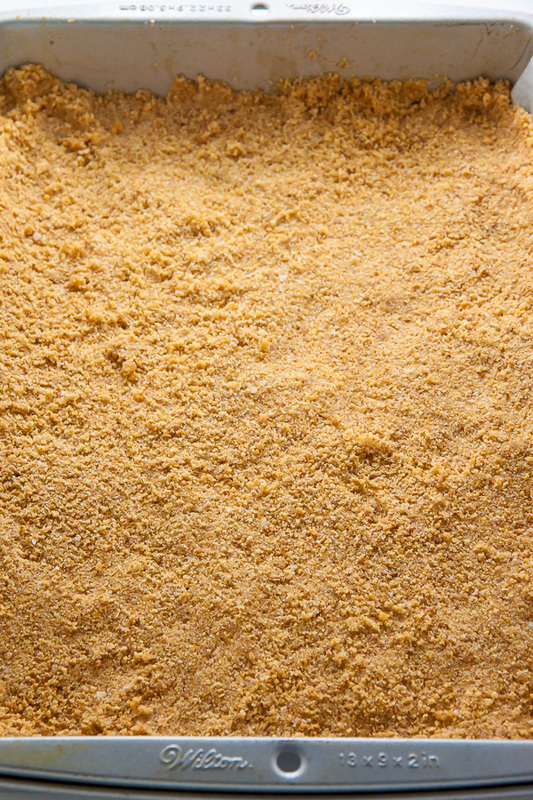 In the body of a blender or food processor, combine graham crackers, sugar, and salt; pulse until the crackers have been completely transformed into fine crumbs. Add melted butter and stir well to combine. Press down evenly into prepared pan. Bake in preheated oven for 10 minutes; set aside to cool. In a large bowl using a handheld electric mixer (or in the bowl of a standmixer fitted with the paddle attachment) beat the cream cheese until completely smooth, scraping down the sides of the bowl as needed; about 3 minutes. Add in the sugar, eggs, and egg yolks and beat until smooth and creamy; about 2 minutes. Turn the mixer off. Using a rubber spatula, fold in the lemon zest and lemon juice, stirring until combined. Quickly fold in the flour, stirring just until combined. Pour the cheesecake batter on top of the partially baked crust. Set aside to make your blackberry swirl. 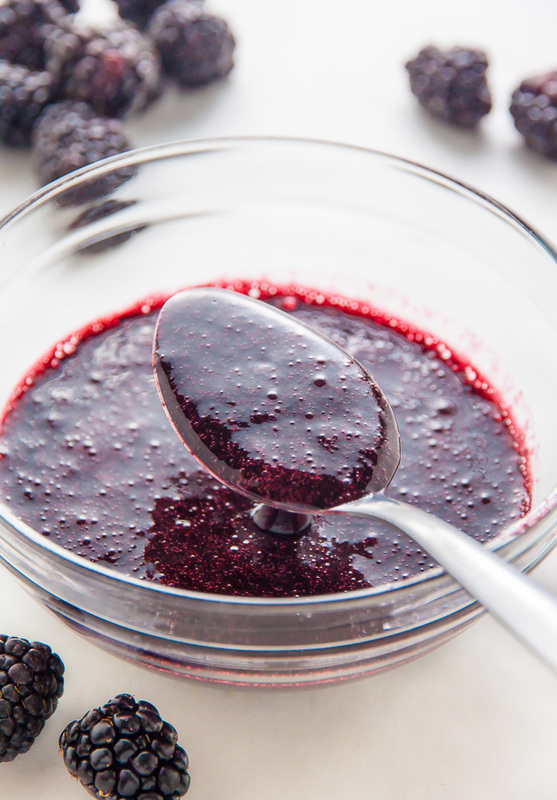 In a small food processor or blender, puree the blackberries until completely smooth. 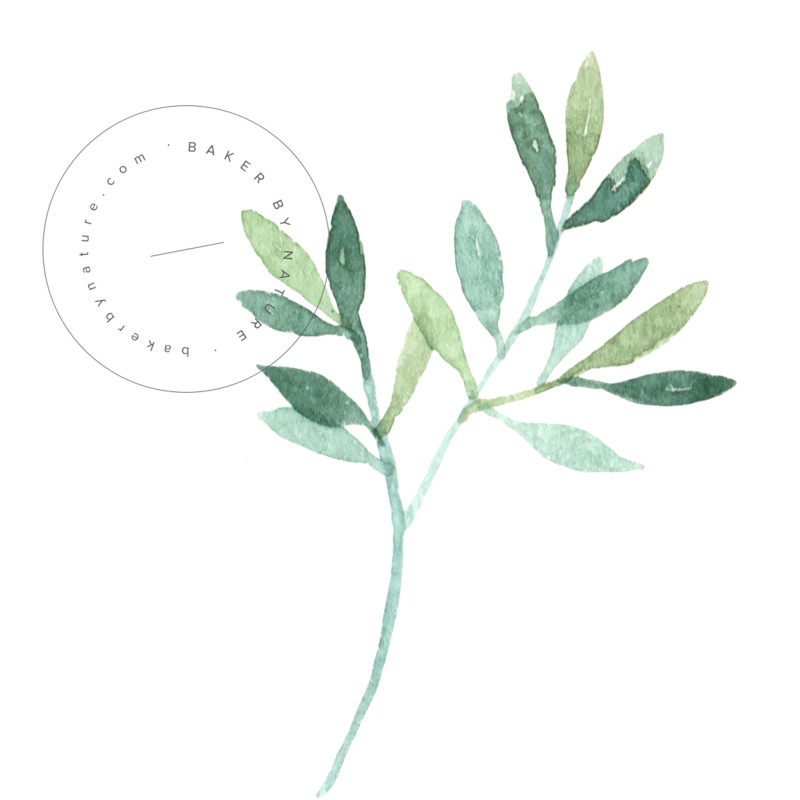 Press the mixture through a fine mesh strainer, discarding seeds and pulp. Stir in the granulated sugar. Spoon the blackberry mixture on top of the unbaked cheesecake layer, a few dollops at a time. Use a skewer to swirl the mixture gently. Bake for 35-40 minutes, or until the cheesecake layer is set at the edges and only slightly wiggly in the center. Place the pan of cheesecake bars on top of a wire cooling rack and cool at room temperature until the pan is no longer hot. Place cheesecake bars in the fridge until completely cooled, about 2 hours. When ready to serve, use the overlapped aluminum foil to lift the cheesecake out and onto a large cutting board. Cut cheesecake into 16 bars and serve. *For best results, recipe should be followed exactly as written. Blackberry puree may be made 1 day in advance and stored in the fridge until needed. *Cheesecake bars will keep, stored in an airtight container in the fridge, for up to 3 days. Hello beautiful dessert! Those swirls are works of perfection! Gorgeous!!! I’d been meaning to do something exactly like this in a couple of weeks, but with a raspberry swirl instead of blackberries. Definitely pinning, AND making! I ended up making a crust between your White Chocolate Raspberry Cheesecake and these bars. They turned out AMAZING!!! 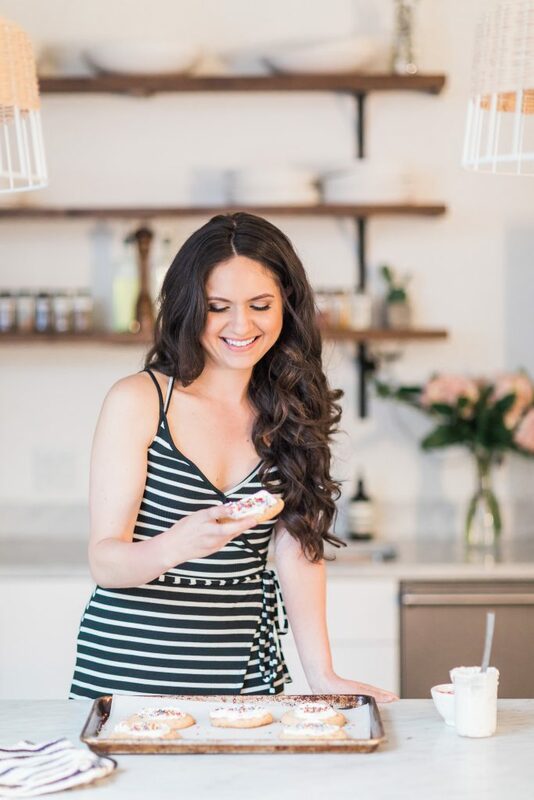 I just posted my recipe, too, if you want to take a peek! Yay! So happy they were a hit. What gorgeous cheesecake bars! Blackberry desserts are so yummy!!!! So perrrrdy, Ashley!! I’m been eating SO many blackberries lately, lol. Thank you so much, Todd!!! And I feel you on the blackberry binging… can’t resist. Is it possible to freeze these and defrost for eating? I saw these on Instagram last week or two weeks ago and thought they were beautiful. I am very picky about cheesecake, but I went ahead and made these for a party last weekend and they were FABULOUS! So many people asked for the recipe or asked to take some home. The combination of the lemon and blackberry flavors with that magical graham cracker crust is perfect! Thank you for sharing. I am a recent follower and am hooked. I prefer a vanilla wafer crust. Think I can swap those out from graham crackers? Second, I only have glass 13×9 dishes. Think that’d be okay instead of a baking pan? Wow, this looks heavenly.. I love your photography too! I’m planning to make these bars for a church potluck and I can’t wait to try them out! Thanks for the recipe!